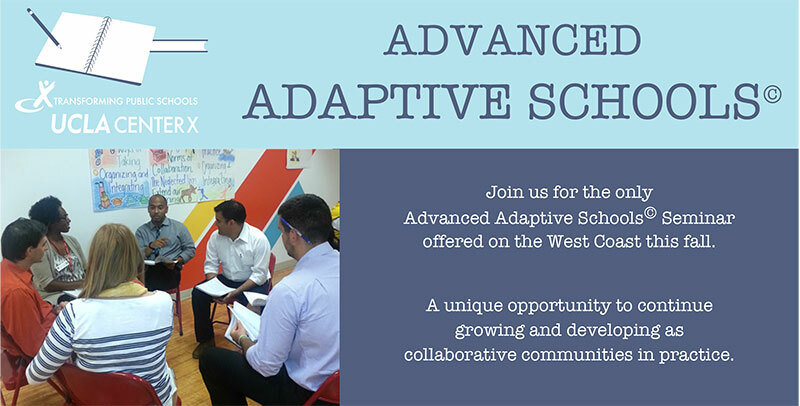 For educators who have completed the Adaptive Schools© Foundations Seminar, the Advanced Adaptive Schools© Seminar provides participants with deepened knowledge and skills for refinement as group members and facilitators in collaborative work. This 4-day seminar brings the expertise of Co-Director of Thinking Collaborative, Doreen Miori-Merola, and the knowledge of Center X Director of Professional Development and Partnerships, Carrie Usui Johnson. Pay by credit card or purchase order. All refunds will be charged a 15% administrative fee. NO REFUNDS will be issued ten business days prior to the start of the Seminar. Parking is available at 606 S. Olive St. for $12/day. Other parking lot and metro options are also available nearby. Doreen Miori-Merola is Co-Director for Thinking Collaborative and a private consultant with M2 Coaching & Consulting. Previously, Doreen was an English teacher for over 38 years, and she taught everything from academic intervention to advanced placement. She has a B.S. from State University of New York at Oswego in English/secondary education, did graduate work in diagnostic and prescriptive reading, and received an M.S. in English Education Advanced Study from Syracuse University. As the English Language Arts Content Specialist for the Solvay Union Free School District – a teacher leadership role – she was in charge of curriculum, assessment, data analysis, professional development, facilitation, mentoring, and AIS for grades 4 through 12. Doreen is a Training Associate for Cognitive Coaching℠, Adaptive Schools©, and Habits of Mind. She has presented workshops on six continents. Carrie Usui Johnson is a Training Associate for Adaptive Schools©, Agency Trainer for Cognitive Coaching and Director of Professional Development and Partnerships at UCLA Center X. Over the past 19 years, Carrie has worked in urban schools in Los Angeles as a teacher, curriculum specialist, instructional and leadership coach, and professional developer. Currently, Carrie supports coaches, teacher leaders, administrators, and school leadership teams in becoming self-directed and resourceful individuals and collaborative groups committed to exploring issues of equity and empowering urban schools.